Television stands each hold aTV of up to 60" and less than 80 lbs. to showcase different services. 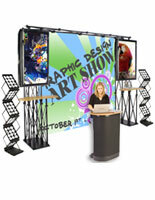 Tradeshow Exhibit features Graphic Pop-Up Display, TV Stands, & Trade Show Counter! 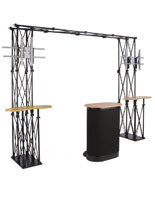 This tradeshow exhibit has a portable truss television stand included. This TV display is a great way to promote different services and have an interactive experience with customers. 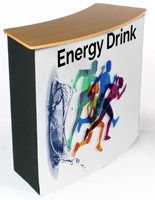 The tradeshow exhibit uses a television stand that holds up to a 60" plasma, LED, or LCD TV, weighing up to 80 lbs. This portable display also comes with a carrying bag. The tradeshow exhibit also has an 8' wide pop-up frame. 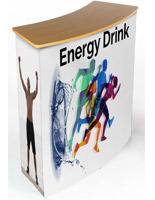 This high resolution graphic prints directly to 22mil PVC panels in 1200dpi. 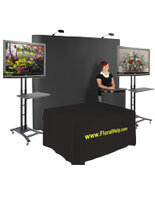 The trade show displays, tradeshow exhibit stands over 7' tall, and includes a carrying case for transport to and from events. 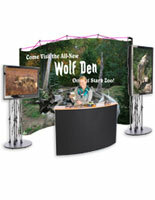 The pop-up style of the frame allows the entire marketing display to be set-up in less than 10 minutes! The tradeshow exhibit also includes a portable counter. 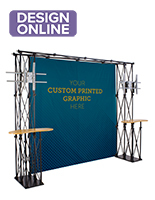 This unit has blue, hook and loop receptive fabric adorning the front and sides of the unit for showing different marketing materials to advertise services provided. 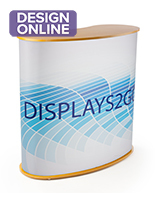 The tradeshow exhibit can have literature holders and graphic display attached to provide customers with additional information. The quick assembly design makes this unit ideal for convention use. 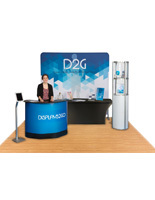 In addition to a large display counter on top, the interior of the trade show displays features (2) smaller shelves for placing marketing materials, additional merchandise, or even the beverages of employees working at the show! We like the actual display and it looks nice, but we aren't at all happy that you don't include graphics of the podium. That's a hassle for us to have to go somewhere else to get that material. Hi Michelle, Thank you for your feedback. We will have a customer care representative reach out to you shortly to follow up.